Home with history and heart. 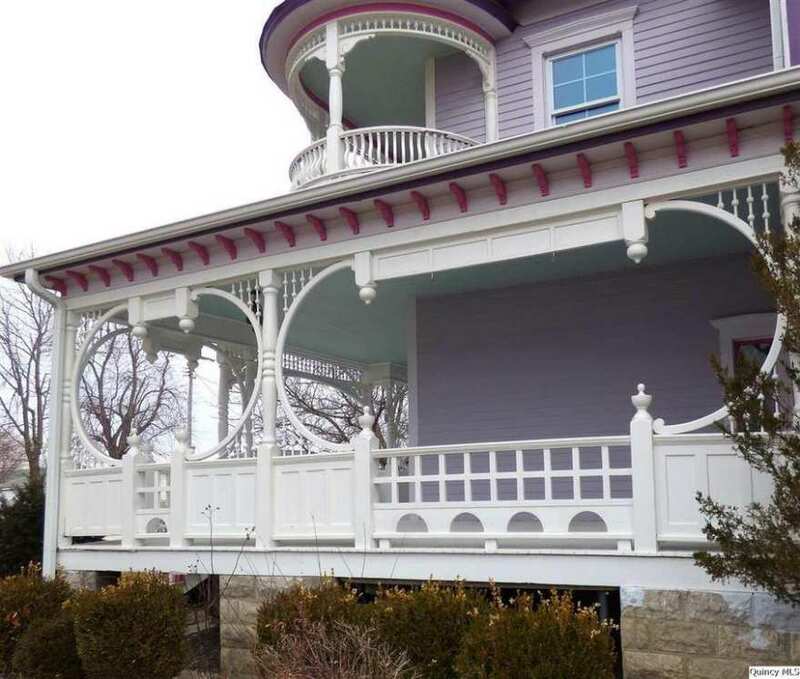 This Victorian beauty has been lovingly restored since 2007 - Plumbing, electric, refinished hardwoods & windows as well as replacement windows, HVAC (dual heat pumps and gas furnace) front porch, upper deck, fencing, pool & water heater, insulation, deck, bathrooms, kitchen, gutters, exterior refinished and basement restoration with dual sump pumps. 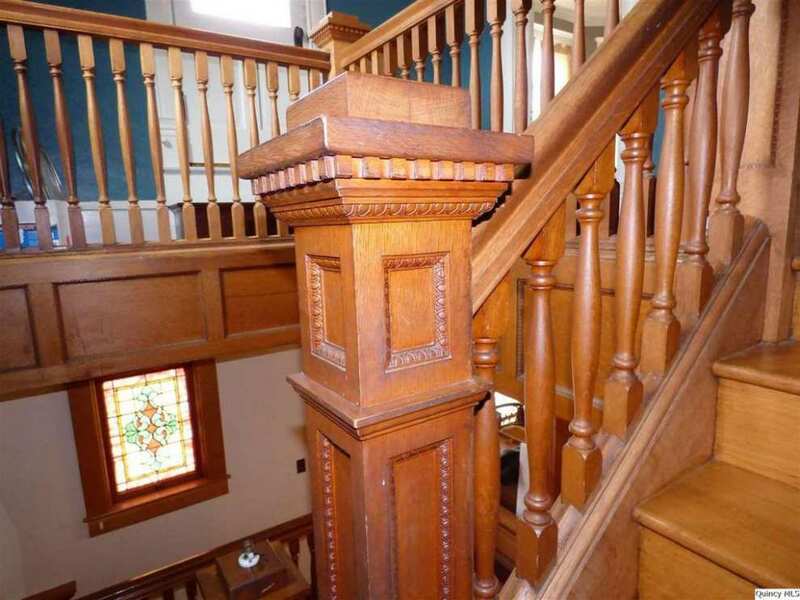 The home features amazing craftsmanship and character. 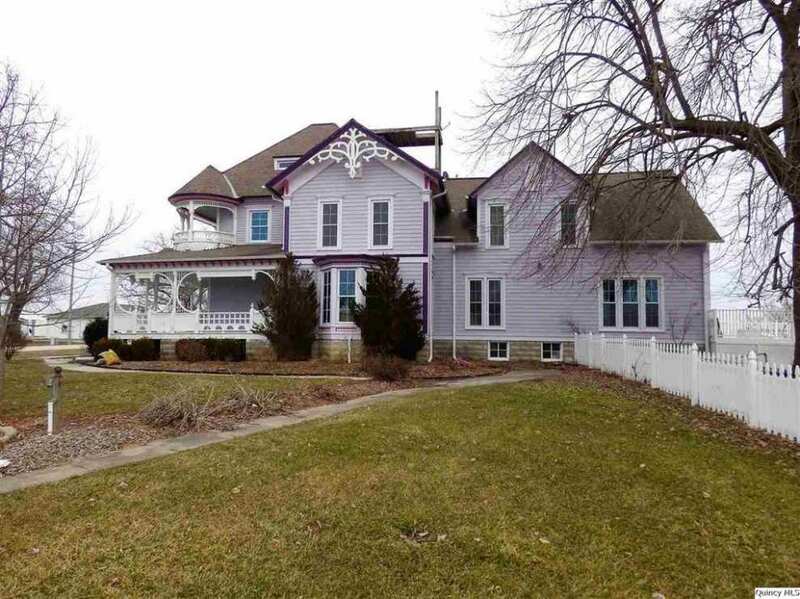 From the intricately detailed wrap around porch and trim outside to the beautiful butternut woodwork, grand entryway and inlaid hardwood floors inside. 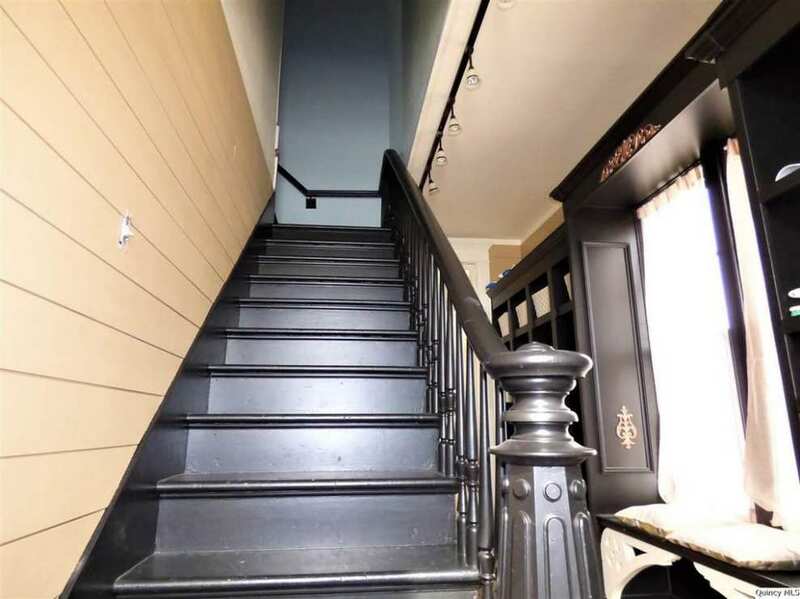 Historic features you will love with all the modern amenities you could need. 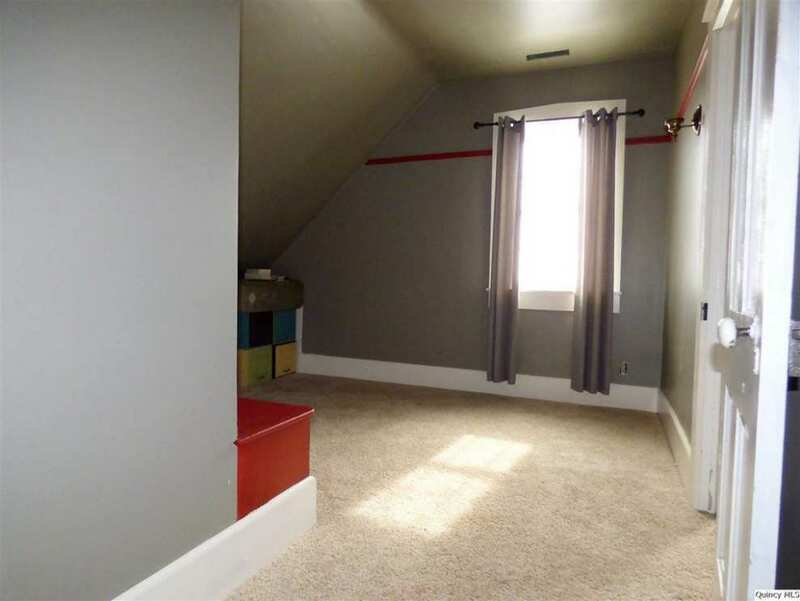 This home makes a perfect place for relaxation and entertaining with room to spare! The build date given is 1872. 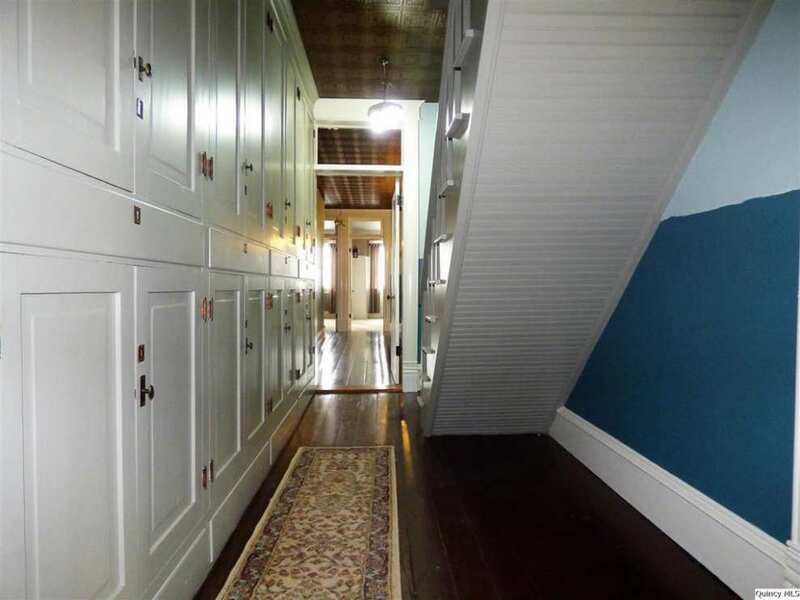 If you look at the photos of the side of the home, you’ll see the original home peeking out. 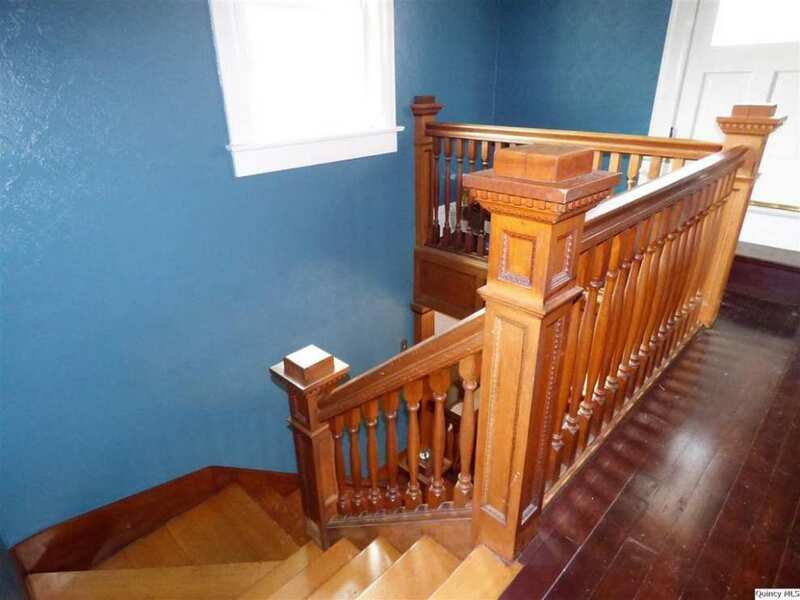 Also the darker staircase is from the 1872 part of the home. I don’t know if this was moved to and attached to the 1872 section or if they built it on about 2 decades or so later. Chris, do you know? Thanks to KTschnooks for sharing! 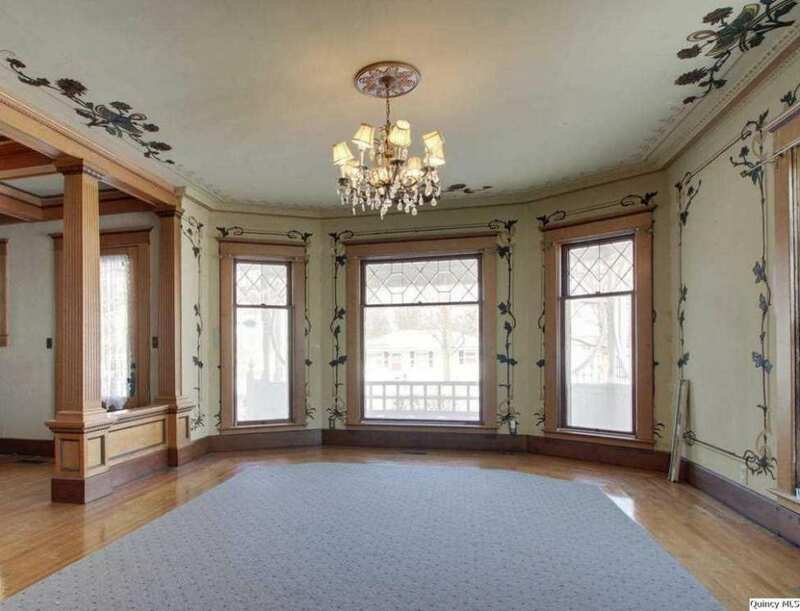 This is the Harm H. Emminga residence who had his Barber designed renovation completed in 1907. 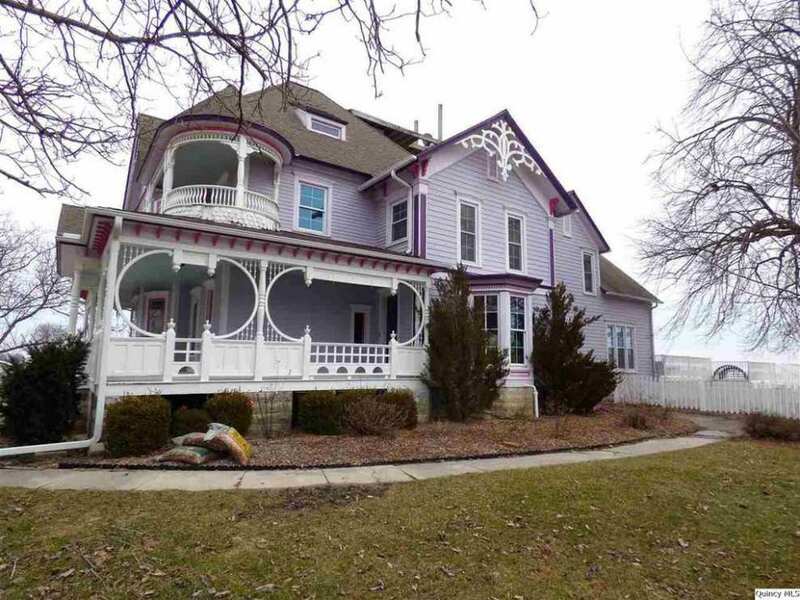 The original house was constructed in 1872 by Harm’s father (Henrich) who also built the historic windmill next door to this home. Another addition was added to the home a bit later, probably in the rear of the house. 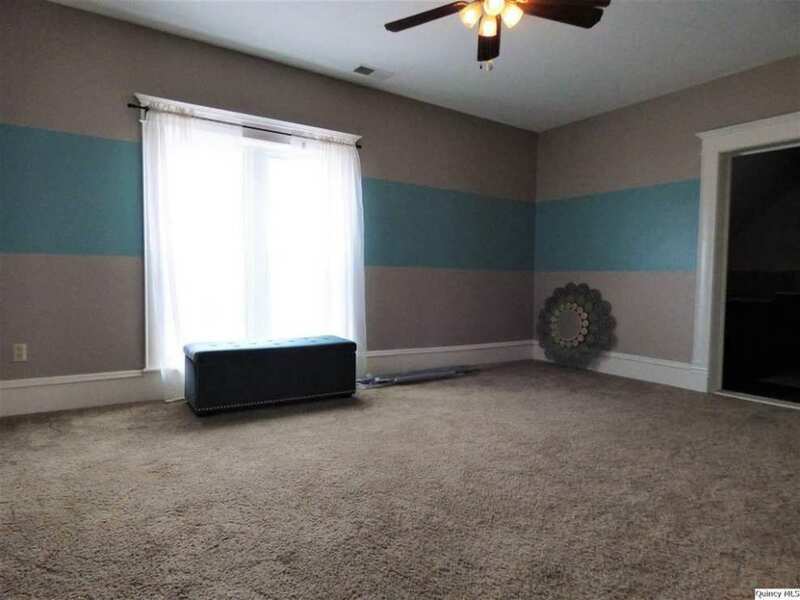 I am not entirely sure of where the demarcation is between the original home and the Barber renovation because I have not yet been able to visit this gem, nor have I seen a current floor plan. 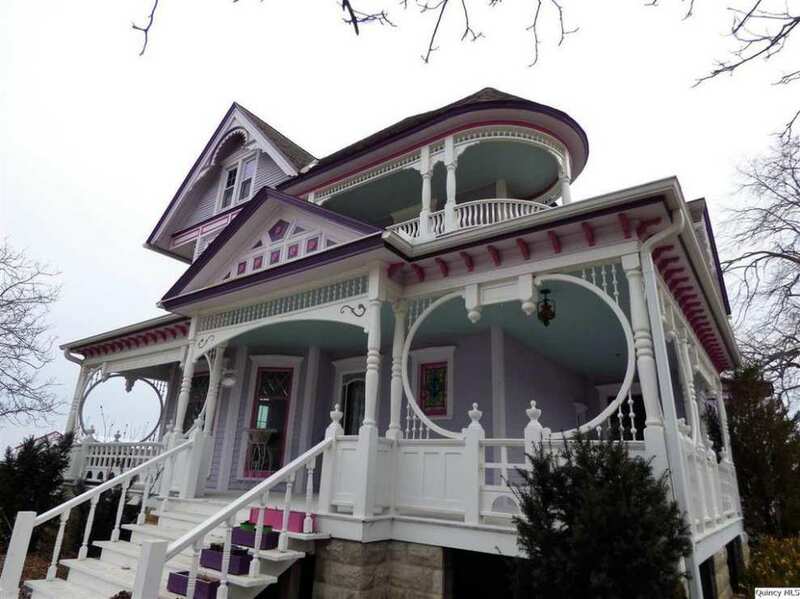 But I am confident that most of the front and right side portions of the home were added to the original house to form the Barber design you see today. Awesome, thanks for the info about it. How fun to have a windmill right next to you. 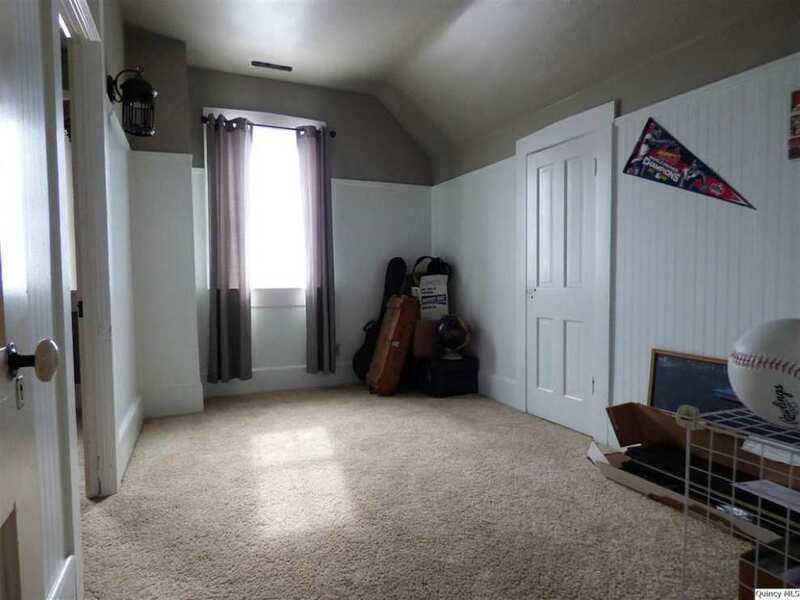 Would love to see a floor plan. It gives you so much prospective. Harm H. Emminga, pioneer Golden resident, banker, village sage, businessman, church man, traveler, historian, scholar, and esteemed citizen, died last Thursday evening at 7:35. It doesn’t say they replaced original windows. Not every time does replacing windows mean it’s a bad thing. 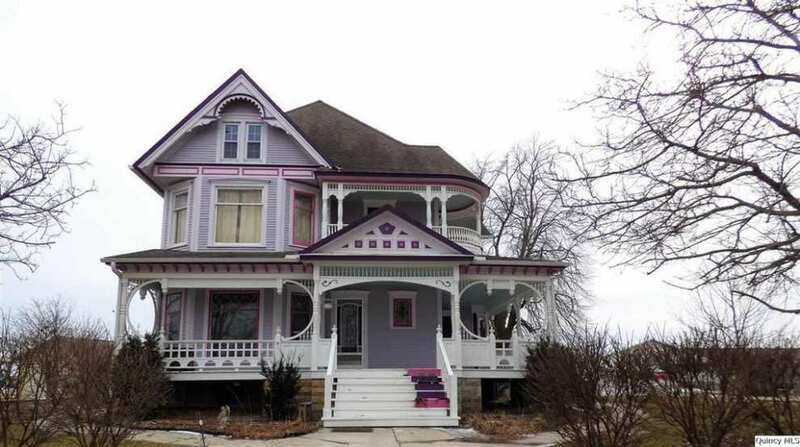 Our 1901 home, I’d GLADLY declare I’m putting in new windows and it would piss people off until I told them none were original but a mix of vinyl, aluminum and falling apart newer wood windows. 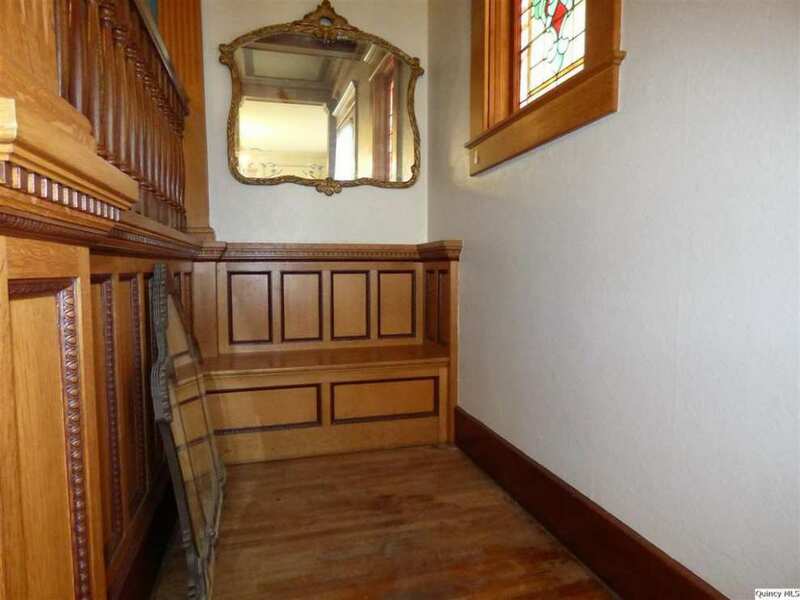 Look closer at the windows they choose, I can’t tell you they are wood or not but they’re at least 4/4 and some have (possibly) original transom/uppers. Wow! Move-in ready and a windmill for a neighbor! Love it <3 They’ve done a beautiful job with the renovations. I can understand that, I am faced with the same situation right now, in fact. My house has older wood replacements, they are literally falling apart. When I replace them I will be using old windows (that I will restore) bought from Craigslist and Facebook Marketplace. I will also be building a set of wooden storm windows for every window. Hopefully they were replacing older replacement windows. Hearing people talk about replacing windows in an old house still causes a knee-jerk reaction in me. Hard to heat and cool a structure with old single pane windows. There are some really nice replacement windows on the market these days. Replacements could also mean salvaged period windows in better condition than what is at hand. The vinyl princess wife of mine had already nearly depleted our house of original windows before I came along. We sleep in a section of the home with single pane windows, and some nights my teeth chatter. My daughters and son have nice cozy rooms to sleep in. My whole point here is: “replacement windows” doesn’t always equal $79 box Home Improvement stuff, nor always equate to a bad thing. 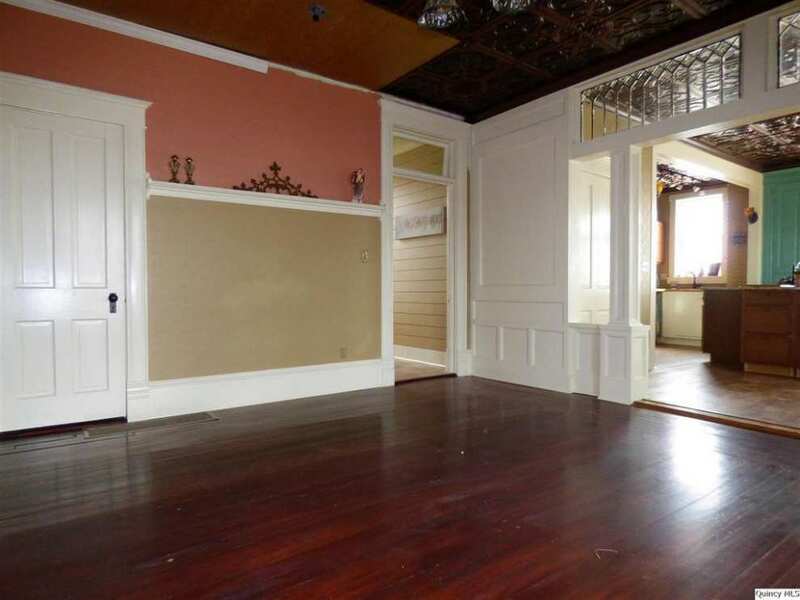 My house has no historical value aside from a pre-1900 build date, but that is a different discussion. Marja, I am also digging the Dutch style windmill. Actually it’s not that hard. Many studies have shown that restoring the original windows and adding storm windows will provide close to or even the same R value as a new replacement window. Only about 10% of energy loss from a house is through Windows and Doors, which means that they will never “pay for themselves” as the replacement window guy promises. You would have to own the replacement windows for 40 to 50 years just to break even. Given that most vinyl replacement windows only last 15 years at the most, installing them means losing money, not saving. And while you may not feel that your house has any historical value, there are many others that could come after you, that do. 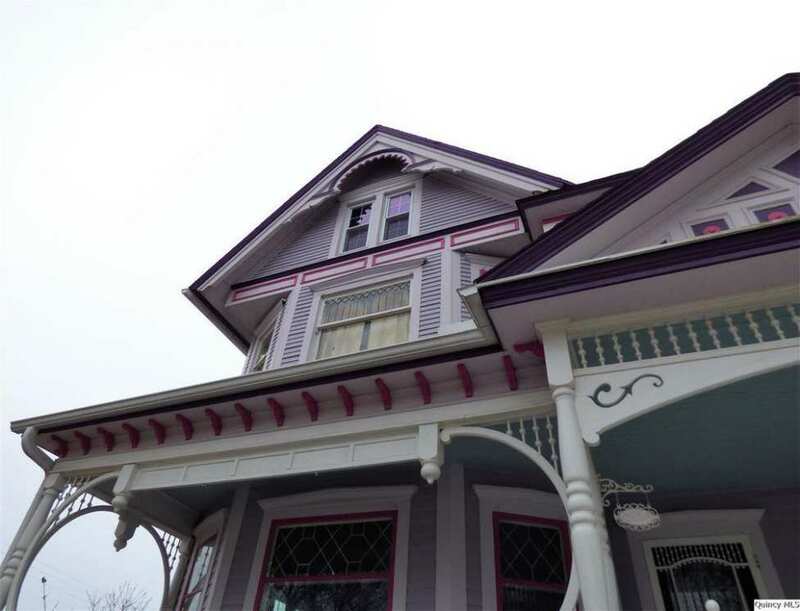 Windows are an integral part of an old homes historic integrity. 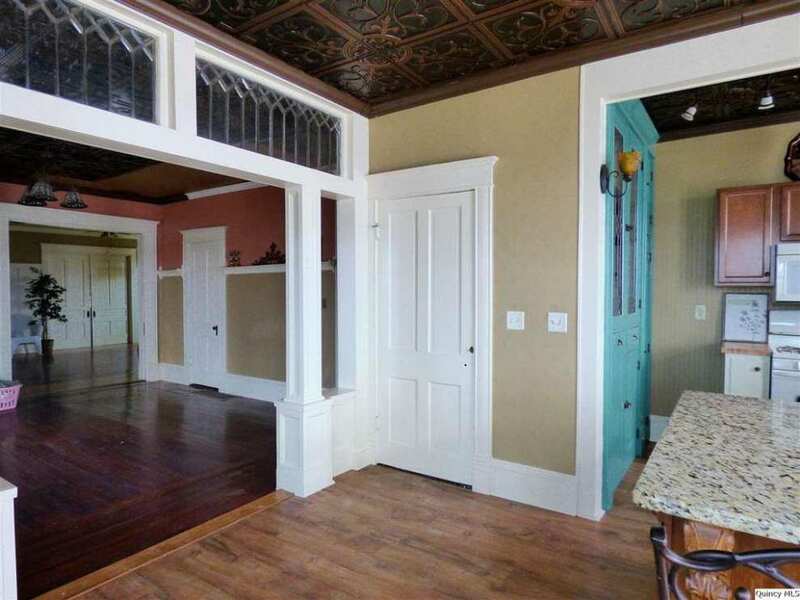 My house was built in 1894. Almost all the window sashes are original. 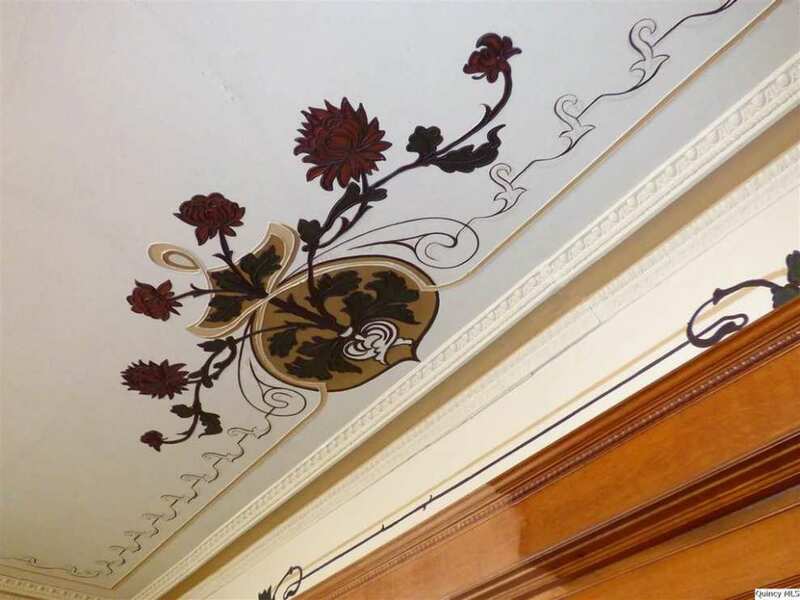 And under the century+ of ancient paint? Pristine old-growth lumber. Pristine. No rot. I am restoring all the windows; about 3/5 are now done. The windows will easily last for another century, unlike replacement windows. After each restored sash is re-installed, I seal them with peel-away caulk. I will not be spending a penny on storm windows. I’ve been in the construction industry my whole life. In the past 25 years, myself or my crew have probably installed somewhere around 2000 plus vinyl windows. In the same 25 years, I’ve probably repaired or built 250 plus wood sashes. There is always two schools of thought when it come to repair or replace and it really depends on the project. If any body would like for me to highlight what I have experienced working with windows over the years, I will be happy to share my experiences. Well for me personally, unless the original windows are completely rotted all the way around, it’s better to save them. Original windows can be rebuilt, whereas most vinyl windows can’t. restored originals can last another 100 years or longer, most vinyl windows will last 15 years, 20 tops. New wood replacements might last 20 to 30 years. But the biggest factor for me is the historic integrity of the house. 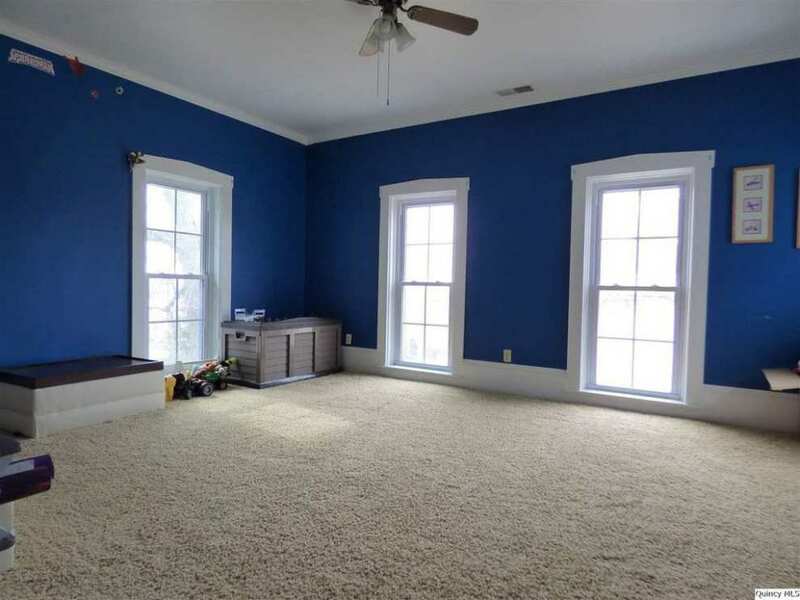 Putting 1 over 1 vinyl windows in a house that originally had 6 over 6, or 9 over 9 ruins the look and more importantly, the historic integrity of the house. Once the originals are gone, they are gone for good. Not too far from me! Maybe a Sunday drive! Beautiful home. I love all of the exterior! There is an old store on Quincy St with the name H H Emminga on it. Connected do you think? Beautiful home!!! I need to talk my husband into getting this one. My husband’s family was from Wierum, Friesland, Netherlands. He is a second generation American. Our last name is Elzinga which is Dutch. It’s very similar to Emminga. Love Your Site! Thank you for the time and effort you put into this amazing Old House Dreams. I come back week after week to see what treasures you’ve listed! What a surprise to see the Dutch windmill in the last photo. Even though that’s more house than my imagination affords me, I can imagine never tiring of washing dishes at the sink and looking out at that windmill. This home certainly has curb appeal, especially with a Dutch windmill right next door & a pool in the backyard! 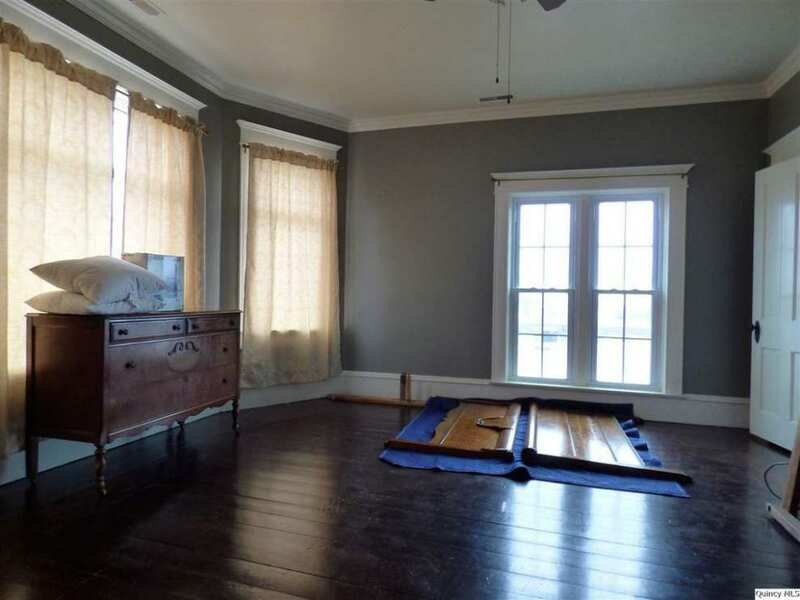 I always learn so much from ” Old House Dreamers”, like about how to replace old windows in homes. I love reading the history of the family and think Metta was an incredible woman, since she traveled and studied music and business & collected Treasures of every sort. What an Antique sale it would have been…It’s sad Metta never married because she was deaf. The windmill alone!!!! 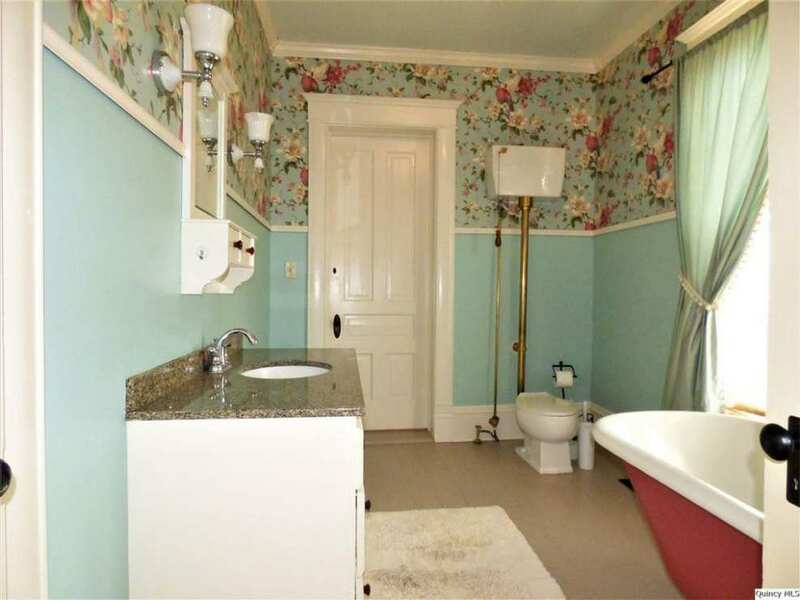 I also really like that pretty teal/salmon pink bathroom. Under 200 hurdred and looks like not much else except a little fininishing up, with a pool, what more can you ask for. I love this house! 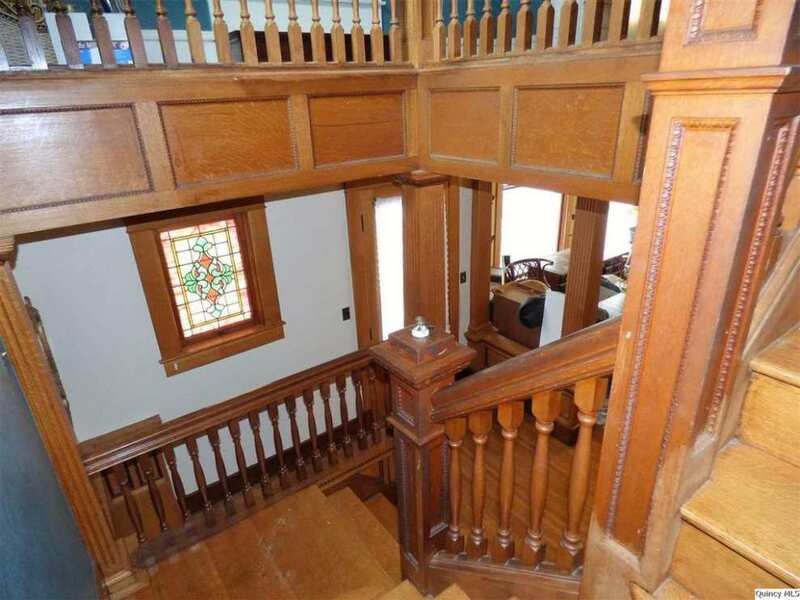 The woodwork, that isn’t painted white, is gorgeous! 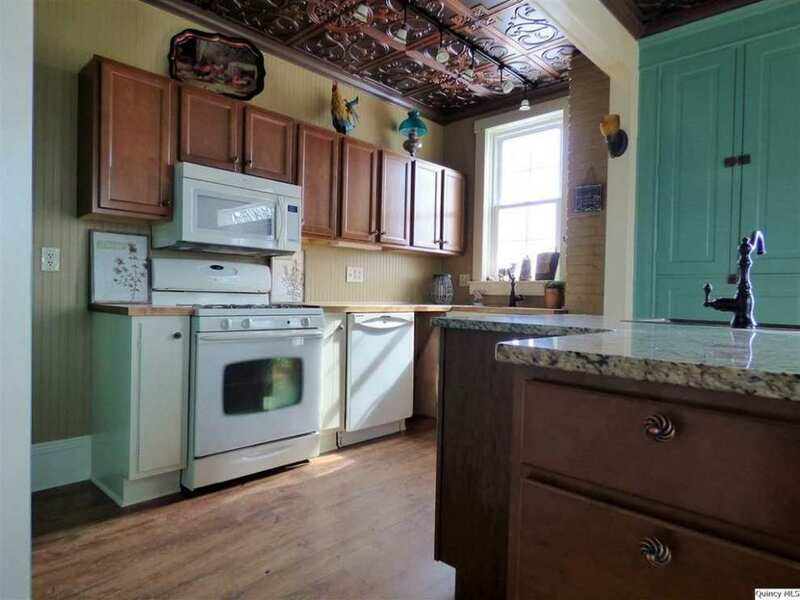 I am confused about the kitchen. It says it had a complete remodel? 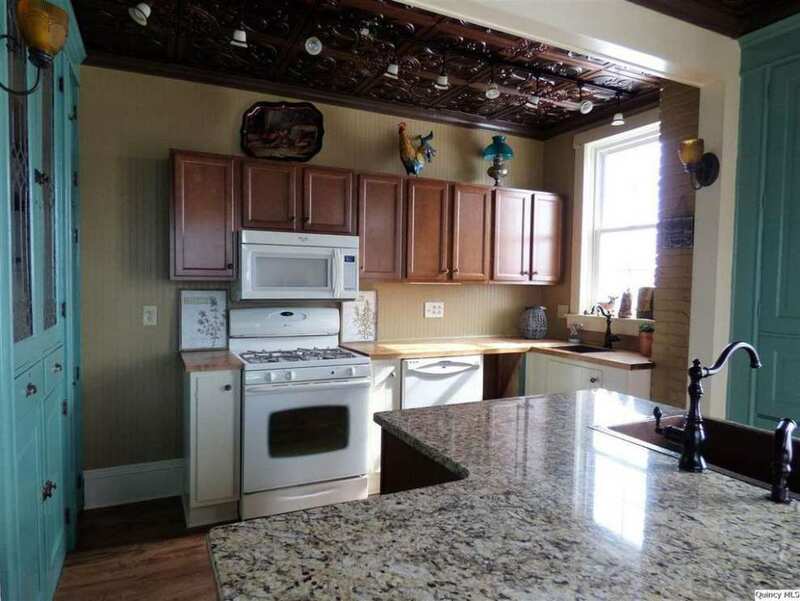 Give me that kitchen and I will do a complete remodel to look like it should for this grand princess of a home. What could be better…a lovely home with design touches by George F. Barber and a Dutch windmill? A friend shared this house with me several days ago and it took me a while touring the tiny community in Streetview to find a small commercial district. Zooming out, I could find no larger towns nearby so its remoteness might be a negative. But tiny communities often tend to be friendly and neighborly. Kelly, your love of old home is so apparent. Thank you for all of the time you put into this and the experts that you pull in to explain things! 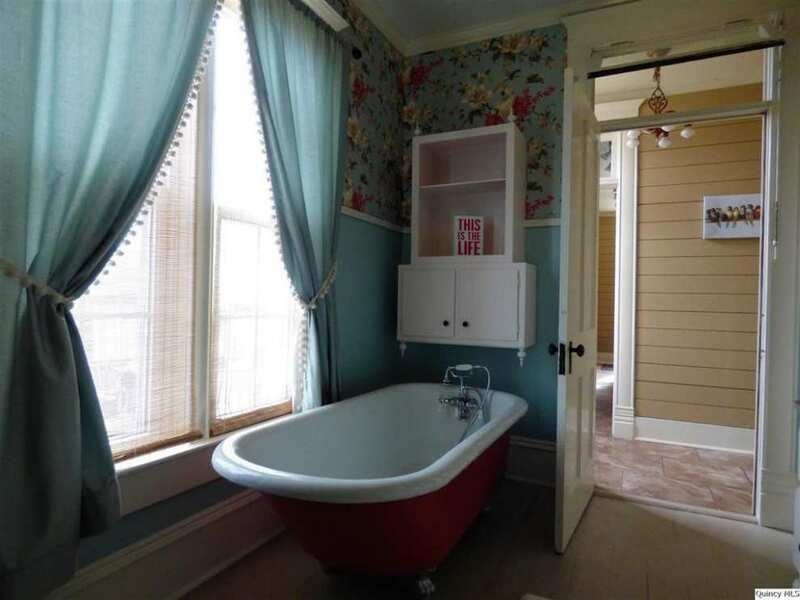 I have always loved old homes – their charm and character. This is such eye candy for me! And this house is no exception. I was in Golden, IL, this past summer visiting an aunt who was a resident of a nursing home located there. The windmill has been around for as long as I can remember and was “an exciting” roadside marker during long drives w/ mom and dad when I was a youngster. I’ve seen and admired this house as I passed through the main road of town. Golden is a nice, sleepy little town not too far from Quincy, IL, and maybe an hour or so from Macomb, IL. 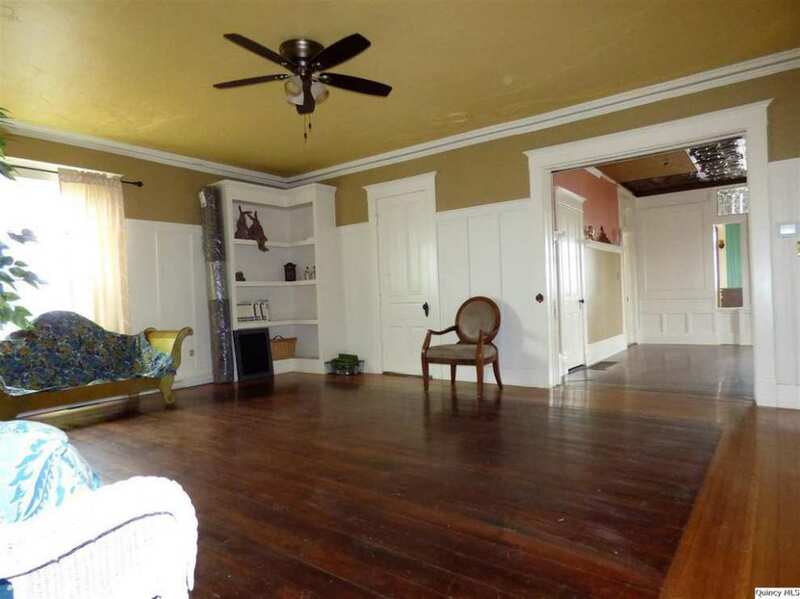 The history of this house is very interesting and the house seems as if it’s in impeccable condition. Thank you for those OHD commenters who provided the history of the family who once lived here…very interesting! 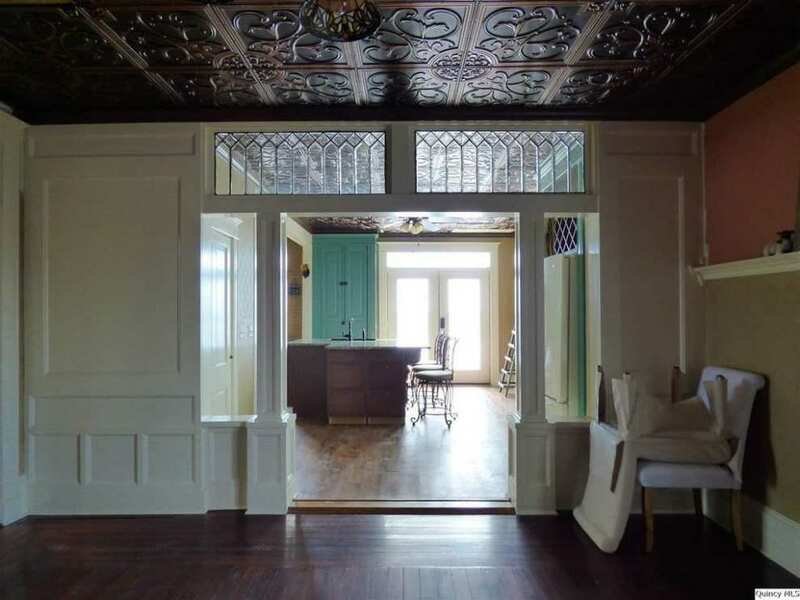 The windows in my 1894 house looked well beyond restoration. They looked like trash, only good for the dumpster. But…but…this turned out to be an inaccurate assessment. Here is my blog post on the shocking BEFORE and the astounding AFTER. Posted before, comments above may be older. 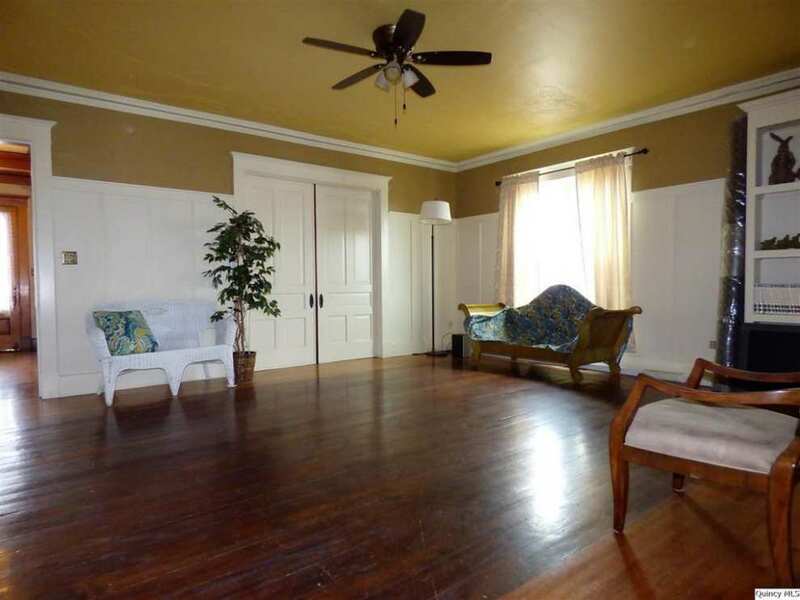 If you are wondering what the windmill is comments are referring to, old listing photos showed the windmill next door. The house is beautiful! 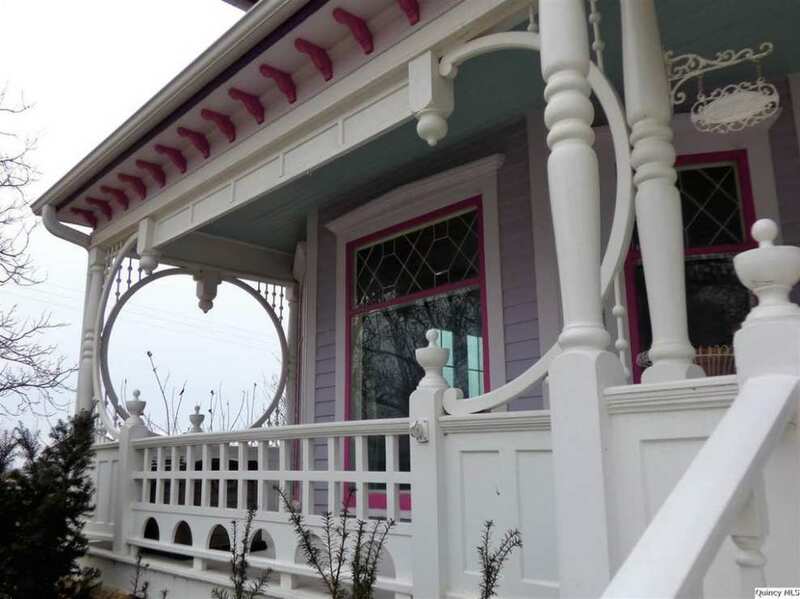 I would probably have picked different colors or at least picked up another color on the porch fenestration. 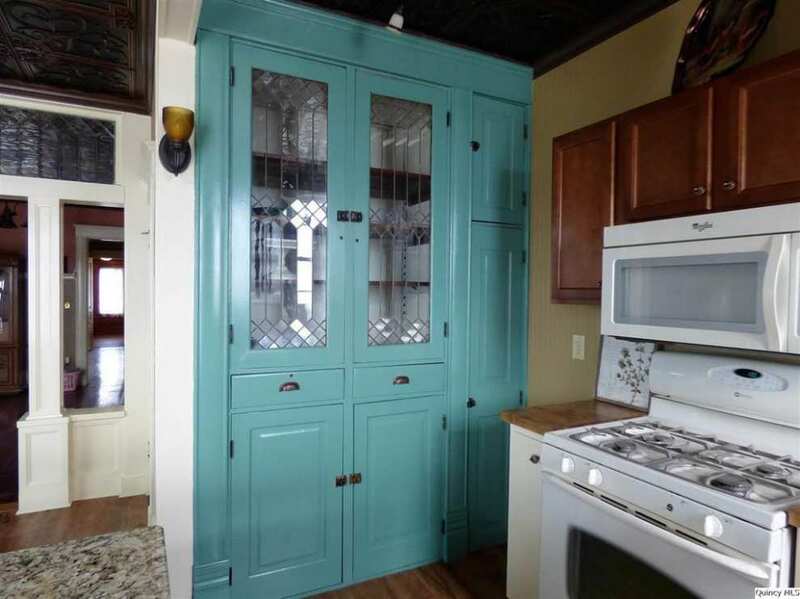 I love all the cabinets in the last picture. Still trying to figure out what part of the house that is in though. 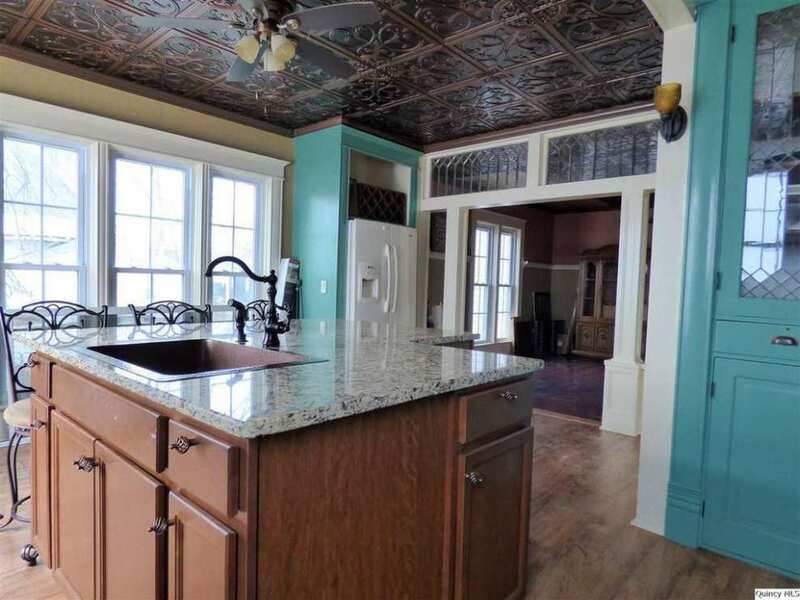 The ceiling artwork and tiles are lovely and so is all that beveled and leaded glass! What is the structure on the roof seen in pics 6 and 7? Scaffolding of some kind? It’s on my short list, though.